If you are looking to store an extensive variety of wine bottles then you need to find something that’s easy to use. In fact, it is even better to have a cooler that will provide you with spaces to take care of not only standard 750mL bottles of wine but also larger magnum bottles or even older bottles that are sensitive to certain conditions. That’s where the NewAir 18-bottle wine cooler can come in handy. This is a wine cooler that features a comfortable design while also being easy to adjust. If you are trying to store an extended number of bottles into your cooler then you can easily benefit from having this in your home. The NewAir 18-bottle cooler is a popular choice that features a solid steel body that features a black outside. The color is striking but it is also capable of reflecting light quite well. This is paired with a stainless steel door that has a protruding handle. This door is accentuated with a glass window that is UV protected. This protection ensures that the wine cooler will be comfortable and will not struggle to keep your wine bottles chilled the right way, thus giving you more control over the quality of your wine bottles. In addition, this features five sliding racks on the inside. These racks are easy to move in and out as you can even remove them all the way in the event that you need to store large things in here. You can fit up to eighteen 750mL bottles at once. In fact, you can remove the lowest shelf and use the open area to store a 1500mL magnum bottle on the bottom part of the cooler if desired. The design ensures that you’ll be able to store practically any kind of wine of interest to you within this cooler. You can easily store this into a cabinet space. It only needs a four-inch clearance on all of its sides for the cooler to fit into a spot. In addition, this is 25.75 inches in height, 14 inches wide and 19.38 inches deep, thus giving you more than enough space for your storage needs. You can even store this in a spot without worrying about it causing more stress onto a surface as it is about 42 pounds in weight. This model uses a thermoelectric cooling system. This transfers cool air all around the body of the cooler. This creates a consistent flow of cool air all around the cooler. This is accentuated even further with several vents within the cooler to make sure the air will move around the entire inside body of the device. This especially work works wonders for your storage needs as it keeps the cooler quiet. It won’t vibrate either, thus ensuring that the contents of your wine bottles won’t be harmed. This is especially important if you have aged wine. You won’t have to worry about getting lots of sediment developing within your cooler either. One exciting part of this cooler is that it is very easy to adjust the conditions within the device. The top area of the cooler features buttons for turning on the light within the cooler and for adjusting the temperature. This is located on the top end of the door and doesn’t even require you to open the door to access it. You can quickly shift the temperature to conditions from 54 to 66 degrees Fahrenheit. The blue LED light on the top part of the inside cooler is designed to light up the inside of the cooler with ease. You can use this to light up your cooler without adding more heat into the spot. This creates an ambient look to the inside of the cooler. This in turn will give you a comfortable look that is handsome and fine to have in any room. 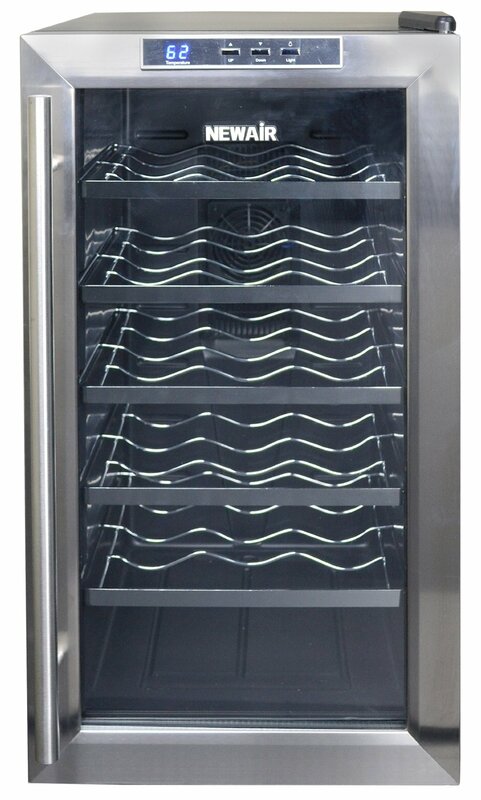 If you need to find something that is appropriate for your wine storage needs while also being very versatile then this NewAir 18-bottle wine cooler can do more for your requirements. You might be surprised to see how well this product can help you out with getting your space covered in the best way possible.